Important, pluripotent precursor of acetylcholine. This dietary supplement has been developed to maintain brain activity and nervous system function, as well as to support the health in general. It is formulated from DMAE bitartrate, a derivative of dimethylaminoethanol, or dimethylethanolamine. Naturally present in fish such as sardines and anchovies, DMAE has attracted scientific interest due to its similarity to choline and phosphatidylcholine, nutrients which play a role in synthesising acetylcholine in the body, one of the nervous system’s main neurotransmitters. As a result of this similarity between dimethylaminoethanol and choline, DMAE bitartrate can be used to maintain or increase acetylcholine levels and thus support brain and nervous system function. Its choline-like properties mean that DMAE acts as a precursor of acetylcholine. Essential for nerve signal transmission, acetylcholine plays a role in the autonomic nervous system by contributing to vegetative functions and muscle coordination. It is also involved in the central nervous system, helping to develop cognitive abilities such as memory and learning. In promoting acetylcholine synthesis, DMAE is thus an important nutrient for the brain. In particular, it may contribute to better muscle coordination and improved cognitive function - hence its popularity both with sportspeople looking to maintain concentration in long-duration exercise and those wish to support their brain activity and cognitive abilities. DMAE is a powerful and effective molecule which has been the subject of several scientific studies. Its use has primarily been associated with increased levels of acetylcholine in the brain. 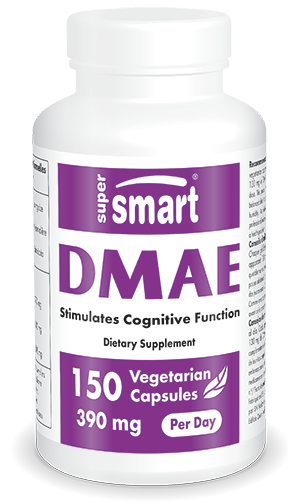 Studies have shown that DMAE may also help improve cognitive function such as memory and concentration. Scientists investigating its therapeutic potential have reported positive effects for combatting cognitive problems such as hyperactivity, attention deficit and loss of memory. In particular, improvements in memorisation, concentration and attention have been observed. Other studies suggest that DMAE also acts at levels in the body other than the neural sphere. Indeed, it seems to improve the complexion and increase maximal oxygen uptake during exercise. The many benefits of DMAE are now available in its bitartrate form as a nutritional supplement, delivered in vegetarian capsules, with a suggested dose of three capsules a day. Other dietary supplements may also be of interest for maintaining brain activity and cognitive function, such as Sodium R-Lipoate, with neuroprotective effects, and two powerful antioxidants formulations: N-Acetyl Cysteine and Perlingual glutathione. Each vegetarian capsule contains 351 mg of DMAE bitartrate, providing 130 mg of DMAE, a metabolite of phosphatidylcholine which is involved in the production of acetylcholine. Take one to three capsules a day.